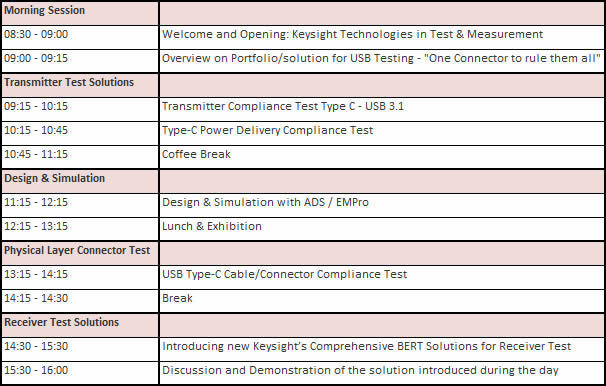 Keysight Technologies is pleased to announce a complimentary seminar focusing on Digital Design and Interconnect Standards, held in Winnersh, UK, 8th June 2016. Keysight Type-C Solution: Create a faster path to done. This full-day seminar is free of charge, presented and discussed by Keysight experts. The USB Implementer’s Forum (USB-IF) has developed the Type-C cable and connector to enable smaller product designs, enhance usability by providing reversible plug orientation and direction, and establish a power delivery and charging infrastructure. Multiple serial standards including USB, Thunderbolt, DisplayPort and MHL, have announced support for the Type-C connector. Keysight’s Type-C solution set —software, instruments and fixtures— is ready for complete testing of the standards converging on this universal interface. Whether you're focused on design or validation, Keysight's solution will accelerate you from debug to characterisation to compliance to done. Visit the upcoming seminar and learn how to address the increasing test challenges. Central topics to be covered are: Power and Signal Integrity, Compliance tests on Transmitter, Receiver, cable and connectors. This session will be a short introduction to Keysight, including the company's latest product overview update. One research indicates CAGR of over 20% in next 5 years for data centre market. Cost effective and power efficient device architectures are demanded by cloud computing and High Speed serial links. One of the measurement challenges today is to enable fast, accurate receiver characterization of single and multi-lanes devices. See how Keysight compliance test software for Infiniium oscilloscopes provides a fast and accurate way to validate and debug your silicon, host, hub, or device for USB 3.1 as an example for all other Type-C standards. In addition to the measurement data, the test report provides margin analysis that gives details on how close your device performance is to the specification requirements. All new USB Type C designs have to comply with the standard not only in terms of signal integrity but also in terms of power requirements. Up to now there are five power profiles to be tested. We will discuss about the test challenges and how to solve them. PCB Designers need Power Integrity checks, High Speed Signal Integrity verification and finally USB 3.1 Compliance pass. The ADS Signal Integrity & Power Integrity release is announcing a new technology to address those verifications using a complete new EM Solver on full PCB. New ADS Signal Integrity solution: SI Pro : Anticipate & Debug Signal Integrity of USB 3.1 PCB before first prototype is built. Validate your design against the USB 3.1 protocol using Compliance Testbenches and Keysight Infiniium. The increase in data rate and the new small connector result in even tougher requirements for the physical layer to ensure interoperability. The E5071C ENA Option TDR can achieve a complete characterization of time and frequency domain tests for USB 3.1 and USB Type-C connectors and cables assemblies. R&D and test engineers who design and test USB 3.1 chipsets are facing new challenges. For receiver test, the doubled physical data rate means the margins for signal integrity are tighter. To ensure proper operation, the receiver must tolerate a mix of different jitter types. Three-tap de-emphasis is required to compensate for the losses of the channel. And finally, the analyser must be able to filter 128-bit/132-bit coded skip-ordered sets with variable length during error counting. This presentation updates you on Keysight´s Bit Error Ratio Test solutions, which allow the most accurate and efficient design verification, characterization, compliance and manufacturing test up to 32Gb/s. To register for the event, held at Keysight's Winnersh site, UK, please click here.